“But you, beloved, building yourselves up on your most holy faith, praying in the Holy Spirit, keep yourselves in the love of God, looking for the mercy of our Lord Jesus Christ unto eternal life…Now to Him who is able to keep you from stumbling, and to present you faultless before the presence of His glory with exceeding joy, to God our Savior, Who alone is wise, be glory and majesty, dominion and power, both now and forever. Amen.” Jud 20-21, 24-25. As I write, we are making final preparations for the mission to India. We leave in about 36 hours, and there is much packing and arranging of the materials for the children’s programs, which will bring over 3,000 young souls under the gracious influence of the Gospel of our Lord. We have also been making preparations for our soon departure from Australia, as we seek to invest our lives more fully in feeding the hungry souls of the third world countries. We are excited to see what God has prepared for this next stage of our earthly adventure, but our hearts are heavy to leave behind such a supportive and faithful congregation at Cross Road Bible Church. In times like these, our words fail in attempting to express our gratitude to God for all He has done and given over the past ten years. The words of Jude above are my best hope to encourage and exhort all of our faithful supporters around the world. The key thought is the phrase “keep yourselves in the love of God”. What safety and security is ours in this troubled world if only we fulfill this command! This is our highest priority in this life. But how are we to fulfill such a high demand? Jude tells us in three spiritual activities: First, by building ourselves (and one another) up in this most holy faith we hold. “Faith” here speaks of the body of doctrine which we have in Scripture. Our first priority is edification through God’s word. Secondly, by praying in the power of the Holy Spirit. We must maintain fellowship with God in surrender to His Spirit. Relationship demands open communication. God speaks to us by His word, we respond in prayer. Our prayer life is a good barometer of our spiritual life. Finally, we should look expectantly for answers to our prayers. This is the “mercy of our Lord Jesus Christ” which contributes to our eternal life, in obedience in time resulting in reward in eternity. It is this mercy we are to boldly seek from the throne of grace (Heb 4:16). After exhorting us to utmost diligence in our “contending for the faith” (v 3), Jude commits our efforts, lives, and outcomes to Him Who alone is “able to keep us from stumbling”. The word was used in ancient times of a sure-footed war-horse. When we obey verses 20-21 we can be sure the omnipotence of God will undertake in our behalf. But if we fail to abide in the love of God, we have placed ourselves beyond the full protection of the Lord, and will suffer the spiritual vulnerability to the world, the flesh, and the devil. Our Lord Jesus Christ now reigns at the Father’s right hand. May we one and all surrender our lives to “Him who is able,” and rest in His wisdom and dominion. In these perilous times, what I have said to our congregation here, I say to us all, “Keep yourselves in the love of God!” Amen. 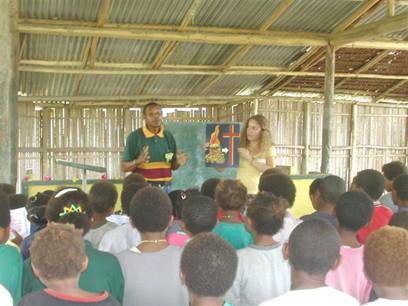 We were recently joined on our mission to PNG (Papua, New Guinea) by Logan and Desiree Carnell from Pine Grove, California. They showed up on our door-step about six months after I had included in a newsletter the Pony Express appeal from 1860, and I concluded with the challenge to “adventurers and risk-takers” in the stamp of Epaphroditus (Phi 2:25-30) to contact us. Logan came with a clipping of the newsletter, saying that he expected to find a long line in front of our house and asking “are we too late?” To date, they are the only response to the article, but we feel like the man who found a treasure buried in a field. Below is a picture of this wonderful couple in Numba village in PNG. They were such an encouragement and help to us in so many ways. They endured the mud, rain, mobs of children, long hours of tedium, and busy ministry with cheerful good humor. What a credit they were to their local church (Amador Bible Church) and their Pastor, Bill Puryear. 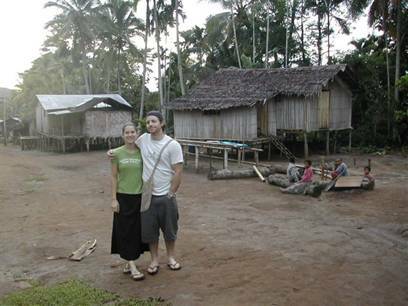 During the time I was teaching the Bible Institute students, Logan and Des would trek with Nan down the track to a neighboring village to help with the growing children’s programs Nan has organized. Des, along with one of our young “adventurers for Christ,” Ellen, would often prepare great meals for us while we were teaching. Ellen, who will also accompany us to India, was our all-around medic and care-taker. She is also proving to be an intrepid soul, committed to a life of service to Christ. 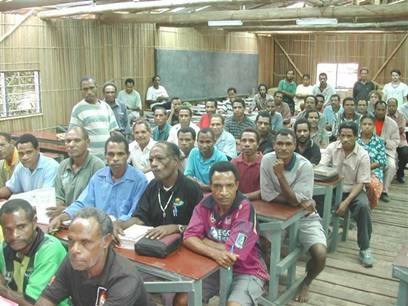 The Bible Institute continues to grow, with one group of students nearing graduation, and a new group starting through the courses. Classes meet five times a year, with some times double courses being offered when we can find the teachers. Please keep the institute here in your prayers, as well as those in India and Zambia. This is our sixth year of Children’s Bible Schools in India working under the invitation of our contact there. We would appreciate your prayers during the time of April 22 to May 8. We will conduct a four day program at two city churches and travel to as many villages as possible during our time to do a one day program with village children. Pray for the members of the team, Gene & Nan, Kim & Erin Maguire, Ellen French, Donna Davies, and Krystina Brown. We all need and appreciate your prayers for effective ministry, wisdom, safety, and good health. Pray for the souls of unbelieving children to be persuaded to believe in Jesus Christ as their Lord and Savior. Pray for the Telegu materials that the children will be bringing back into Hindu and Muslim homes. Our desire is for them to reach hungry souls who will respond to God’s love. Pray for the Christian children to be strengthened in their faith and understanding of God’s Word. We plan to arrive in Arizona at the end of May. We will have a busy summer schedule with Arkansas camp (June 12-16), Florida camp (June 19-22), Pennsylvania camp (July 24-29), and Arizona camp (August 2-6). Our new website should be up by early June, and will have application forms for the Arizona camp. Otherwise, you can contact the BTBM office in Hot Springs (501-525-6641), or email basictraining@sbcglobal.net Please remember us as we make this transition and for the congregation here, who will be under the care of Jared and Tiersa Donigian. Keep Jared and Tiersa in prayer as this is a big and bold move on their part as well. How thankful we are to God for providing them to minister to this fine local church. 1. Thanksgiving for all God has done for us through the saints here over ten years. 2. Smooth transition for the church here, and our move to Arizona. 3. Jared and Tiersa as they settle in to this new and exciting ministry in Australia. 4. For Cheryl, as she mans the office in Arkansas. We are so thankful for her service.